Our portfolio is really starting to take shape now that we've completed designing a new banner and inserting it into the header. Our next step is to insert and style content for each of our pages. We will start with the resume page because it contains several tags/elements we will be using across all of our pages. When inserting content from another source, such as copying and pasting content from a Word document, it's important you understand that this is an imperfect method for inserting content into Dreamweaver. This is due to the fact that Word uses different tags and methods for styling content in a Word document than Dreamweaver, or HTML, does. What this means for us is we will need to perform some extra steps prior to styling the content so the formatting of our resume page looks clean and professional – just like the Word version!. 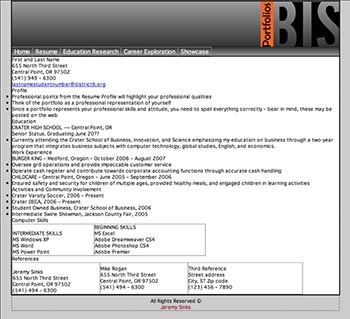 Disclaimer: the resume tutorials are based on a generic resume example. You will be using your own resume, so you may need to adjust accordingly – use your noodle, problem solve if you run into problems! Dreamweaver gives you four (4) different options for pasting copied items into a document. None is a perfect method, but each serves a different function depending on the content you wish to insert. 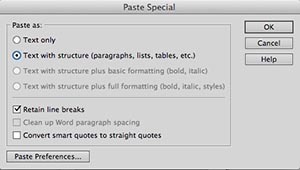 The amount of applied formatting in a Word document will determine which method you choose. Be advised that the 4th option is NOT RECOMMENDED because this method will bring additional styling from Word that is often difficult to change. In the next exercise, we will apply the correct formatting, i.e., tags/elements, to the resume content.